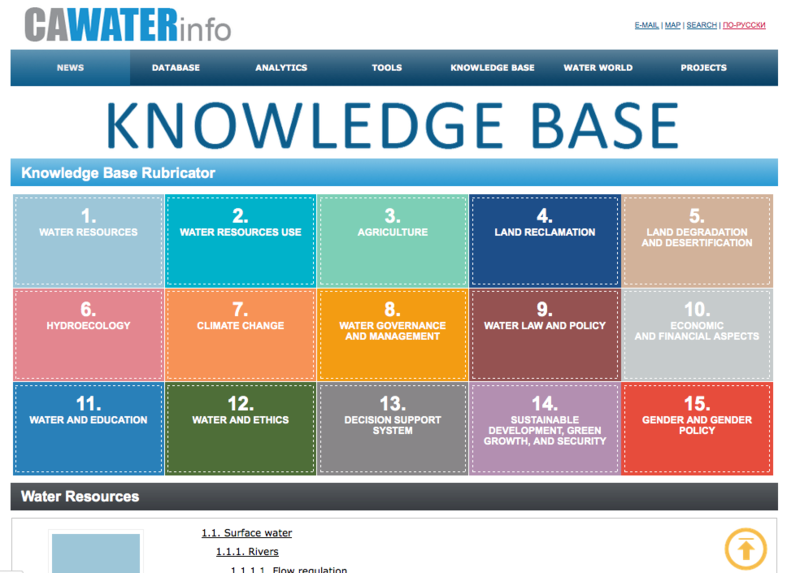 ‘Water in Central Asia’ Knowledge Base was developed within the CAWater-Info portal (http://cawater-info.net/bk/rubricator_e.htm). This regional Internet portal established by Scientific Information Center of Interstate Commission for Water Coordination (SIC ICWC) in Central Asia with support from Swiss Development Cooperation (SDC) provides access to up-to-date data, information and knowledge on water and related issues in Central Asian region. 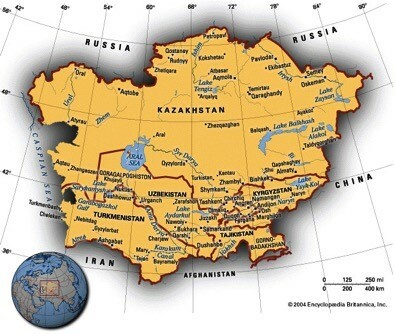 The geographical scope of the case is Central Asia (see Map 1), which comprised of the Republic of Kazakhstan, Kyrgyz Republic, the Republic of Tajikistan, Turkmenistan and the Republic of Uzbekistan. A particular focus is made on the Aral Sea Basin, covering an area of 1,550,000 km2, as the largest basin in Central Asia. It encompasses the entire territory of Tajikistan and Uzbekistan, the major part of Turkmenistan (excluding the Krasnovodsk region), southern part of Kazakhstan (the Kzyl-Orda and the South Kazakh regions), three regions of the Kyrgyz Republic (Osh, Djalalabad, and Naryn), part of northern Afghanistan, and north-eastern Iran. The Amudarya and Syrdarya are the two major rivers belonging to the basin of the Aral Sea. The social and economic development of Central Asian Republics depends on the waters of the Amudarya and the Syrdarya rivers, and there are many competing claims over the use of their waters for irrigation, hydropower, and the environment. Given the utmost importance of water resources for economies, people and ecosystems, a lot of water-related scientific and practical activities are taking place in Central Asia. A wealth of smart and locally adapted solutions, methods, and techniques are accumulated in scientific and research institutions. However, the use of these research outputs in practice is inadequate. This is mainly due to limited access to available knowledge and absence of effective knowledge transfer mechanisms. Meanwhile, knowledge-driven changes in water and land management are of paramount importance to achieve water security in Central Asia. Successful examples from China, South Korea, Israel, Qatar and many other countries demonstrate advantages derived from sound linkages and interconnections between practice, advanced technologies and science-based solutions. Another constraint is that knowledge of various links between water, food, energy, ecosystems and climate change is incomplete, and nested within different sectors and scientific communities. This is especially so in the transboundary water management setting. To address these gaps, SIC ICWC in Central Asia gives special consideration to establishing a sound knowledge management system as a basis to foster transboundary water cooperation and promote sustainable water management in the countries of Central Asia. To deliver transboundary water security and sustainable water management in Central Asia, SIC ICWC builds on its strengths in the four areas: 1) Research and expert advice, 2) Data and Information, 3) Capacity building, and 4) Communication and Networking. All these areas of activities feed into and make use of a water-related knowledge base, which was developed to make better use of knowledge accumulated from field works, scientific research and water-related projects in Central Asia. ‘Water in Central Asia’ Knowledge Base was developed within the CAWater-Info portal (http://cawater-info.net/bk/rubricator_e.htm). This regional Internet portal established by SIC ICWC with support from Swiss Development Cooperation provides access to up-to-date information on water and related issues in the region. The CAWater-Info Knowledge Base is comprised of thematic knowledge bases such as “Land and Water Resources Use in the Aral Sea Basin”; “Integrated Water Resources Management: Experience of Central Asia”; “International and National Water Law”; “Land Law”; “Land Reclamation and Irrigated Agriculture”; “Safety of Hydraulic Structures”; “Knowledge Base for the Amudarya, Syrdarya, Zeravshan, Karadarya, Chirchik Basins”; “Gender and Water”, “Afghanistan”; and “Water Quality”. The CAWater-Info Knowledge Base includes various knowledge tools such as reference databases for “Land and Water Resources Use in the Aral Sea Basin”, glossaries, e-library, reviews, and training materials. In 2013, a Rubricator was created to systematize scientific and technical information available in the Knowledge Base and enable key words search throughout the portal. The Rubricator was designed according to the “knowledge tree” principle. The Knowledge Base and its Rubricator are expandable resources and built with the involvement of subject matter experts. Currently, the Rubricator has 15 sections: Water Resources; Water Resources Use; Agriculture; Land Reclamation; Land Degradation and Desertification; Hydroecology; Climate Change; Water Governance and Management; Water Law and Policy; Economic and Financial Aspects; Water and Education; Water and Ethics; Decision Support System; Sustainable Development, “Green Growth” and Security; Gender and Gender Policy (see Figure 1). Each of these sections has sub-sections, which are systemized in a specific hierarchical order. The Rubricator’s sub-sections are comprised of the descriptive part that provides brief information on a subject and references section enriched by primary sources and other relevant materials in the form of books, monographs, articles, reports, white papers and so on. Particular attention is paid to the preservation of past knowledge derived from rare and valuable books that have scientific and historical value. The CAWater-Info Knowledge Base accumulates knowledge (e.g. lessons and best practices from projects, research, networking) from various activities of SIC ICWC and also feeds back into them (e.g. course materials for training program). See Figure 2. Our task is to accumulate knowledge produced in pre-Soviet and Soviet times as well as after gaining independence by Central Asian countries, to merge it and enrich with modern approaches in the fields of water and irrigation around the globe with a view of providing access to this knowledge to a wide audience of water and agriculture practitioners in Central Asia and also in countries of Eastern Europe and Caucasus. This will allow the establishment of a system for transferring knowledge and best practices, including scientific developments, to water organizations, farmers and their organizations in order to ensure more efficient water management and use, growth of water and land productivity and risk management under climate change. This case can easily be applied to other geographical areas. Moreover, there is an intention to establish Water Management Knowledge Centers in Central Asia as part of global knowledge hub campaign initiated in the early XXI century. 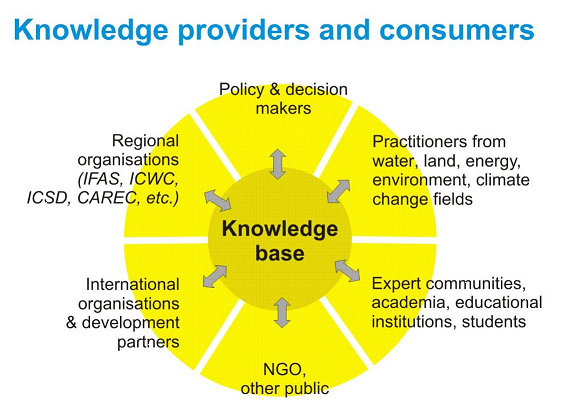 These global knowledge hubs together with international institutions such as FAO, GCIAGR, and UN-Water among other things deal with the development of global water and land knowledge bases (FAOSTAT, IWA WaterWIKI, ICID Knowledge Base, etc.). Knowledge system, regularly enriched with best practices in water management, irrigated agriculture and associated sectors all over the world, should become an important tool for better performance of these critical sectors for sustainable development in Central Asia. Knowledge based water resources management can add real value. By creating access to data, information and knowledge, enabling communication, knowledge systems, if applied in line with local conditions, can be promising instrument in reaching water security objectives. In particular, SIC ICWC’s knowledge system adds value through adapting global and regional knowledge to local conditions; facilitating regional knowledge exchange; enabling continuous learning and education; promoting knowledge transfer to end users; and supporting decision makers and practitioners. Focus on target groups’ (knowledge consumers) needs and preferences in knowledge dissemination in order for them to use knowledge in a meaningful and effective way. As a result, knowledge providers and consumers will help to expand and strengthen Water in Central Asia Knowledge Base into an innovative knowledge platform that unites a network of researchers, practitioners, and decision makers in sharing experiences and lessons from managing water and related resources. See Figure 3. See additional information here: sic.icwc-aral.uz, cawater-info.net, cawater-maps.net, eecca-water.net, icwc-aral.uz, asbmm.uz, aralbasin.net.